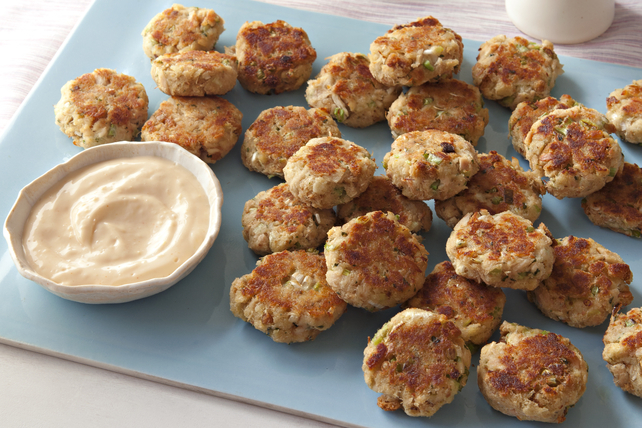 We've taken one of our most popular tuna cake recipes and made it into an appetizer recipe. Simple, cheesy and held together with hearty stuffing, these Mini Tuna Appetizer Cakes are party-perfect fare. Mix first 6 ingredients and 1/4 cup Miracle Whip just until blended. Shape into 30 small patties, using 1 Tbsp. tuna mixture for each. Place on baking sheet sprayed with cooking spray. Refrigerate 1 hour. Heat oven to 400ºF. Spray patties lightly with cooking spray. Bake 8 to 10 min. on each side or until golden brown on both sides. Meanwhile, combine remaining Miracle Whip, hot sauce, lemon zest and juice. Serve tuna cakes with sauce. Patties can be refrigerated up to 24 hours before cooking as directed. Prepare using 2 cans (170 g each) chunk crabmeat, drained and flaked.